If you could live in any fictional world, which would it be and why? It could be from a movie, TV show, or book (or you could tell us all three!). 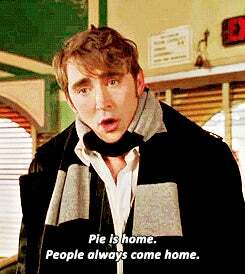 My very first choice is to live in the world of Pushing Daisies. I feel like I’d just walk around staring at everything/everyone and eating amazing food. Oh, and buying beautiful clothes with crazy-awesome hats. And hopefully not dying in poetic, ironic, or beautiful ways. Everyone has interesting jobs and histories and the world is so lush and gorgeous... I just. I want to be there.